Dining in Branson can be tricky as most of the restaurants in this great vacation destination offer a wide selection of dining options including fine dining, steakhouse, seafood, pizza and BBQ and family restaurants as well as eclectic eateries, and chain restaurants. Many of the restaurants serve delicious food that will truly satisfy each appetite. Dining in Branson can be enjoyed best if you dine at some of the hot dining spots in Historic Downtown Branson such as Farmhouse Restaurant, Branson Café, and White River Fish House. Farmhouse Restaurant is an upscale restaurant in the Historic Downtown Branson that offers savory and hearty meals. This dining spot boasts an intimate and welcoming atmosphere with friendly servers who make sure you enjoy your time. To enjoy a great dining experience in this cozy restaurant, try their signature dishes such as lightly breaded catfish, fried chicken or homemade blackberry cobbler with traditional sides like red skin mashed potatoes, cinnamon apples, sweet potato fries, fried okra and more. The food specialties served at Farmhouse Restaurant are the reasons that guests come back time and again. These include Chicken & Dumplings, Shrimp Plate, Flame-Grilled Pork Chop, and the Whole Catfish Dinner. The sides include everything such as Baked Beans and the “only in the South” option, like Fried Okra. If you want to skip their signature Blackberry Cobbler, you can give a try with their delicious dessert, the Apple Maple Pie. Their breakfast menu includes options like Biscuits & Gravy, eggs, pancakes, and lots of sides. Branson Café is another upscale restaurant in Branson located in the historic downtown area and beautifully surrounded by quaint shops and theaters. Established in 1910, Branson Café has been serving up delicious, homestyle meals more than a century ago. 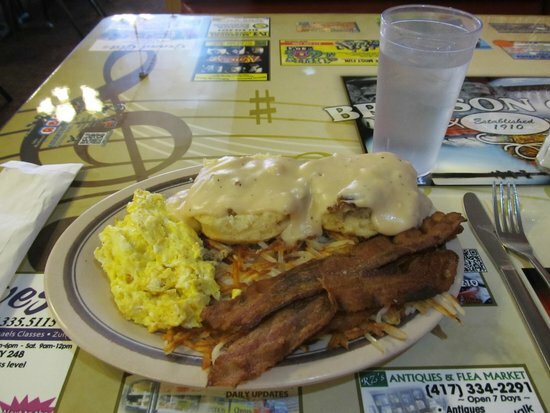 This is the restaurant that offers comfort food like chicken fried steak, pot roast and meatloaf or breakfast favorites like biscuits and gravy, omelets, pancakes and hash browns. For guests who long for sweet treats, the Branson Café offers fresh baked goods like pies and giant cinnamon rolls. The friendly service and affordable prices make this restaurant more likeable to eat and its small town charm keeps both locals and tourists coming back for more. The White River Fish House is another top restaurant in Branson that serves hearty country cooking including seafood dishes. When dining at the White River Fish House, you can see the most beautiful view of the pristine waters of Lake Taneycomo from floor to ceiling. The floating restaurant which is actually located in a floating barge is serving up local favorites to fishermen and shoppers alike. When you dine at the White River Fish House in Branson, you will enjoy a good variety of menu selections served up in large portions including appetizers such as fantastic home-style cornbread and Venison Stuffed Mushrooms. When you want to enjoy fine dining in Branson, don’t miss to visit the Historic Downtown Branson as it’s in this place where you can find some of the hottest restaurants in town.